If you’re a Zendesk user in a Contact Center environment, you’ll want to be using our Zendesk Agent Scripting app. This makes it easy to guide, train and onboard agents and is a huge productivity booster for everyone. Standardization: Show a guided path for each ticket, so that Agents follow the proper operating policies or troubleshooting procedures. Pause and Resume: If a ticket is transferred, the supervisor or new agent is taken to the last place in the script, and can see the history of the previous steps taken. Automatic Script Selection: The Agent Scripting App can choose a script based on the Zendesk brand, Zendesk ticket tags, or the value of a custom field. Agent Feedback: Agents can send feedback directly to the authors of the decision trees with a single button click. Feedback is delivered to each author’s email, and includes the tree ID and node number where the feedback was sent from. Zendesk Ticket Data in your Scripts: Values in any custom field, as well as Zendesk ticket tags and user tags, are transferred into your script so you can echo them, or use these variables to branch via Logic Nodes. 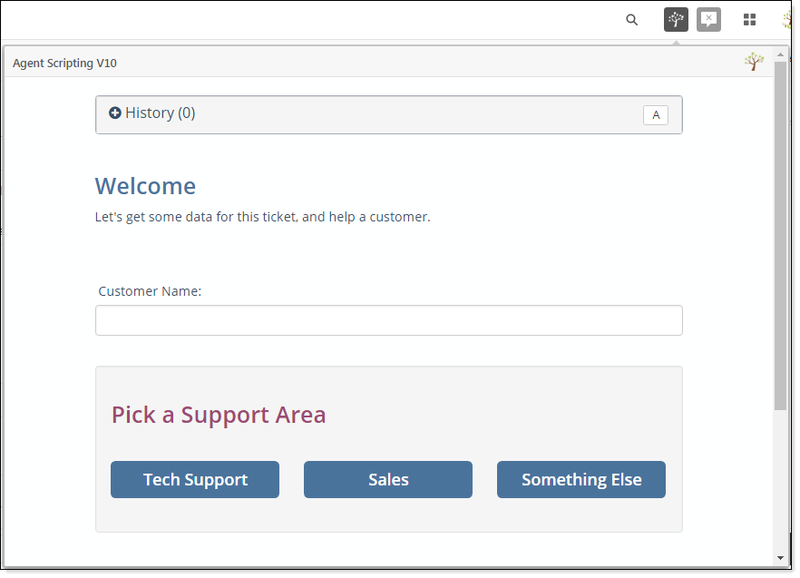 Automatic Ticket Updating: Tags and custom fields in the ticket can be updated from actions in the script – either via buttons clicked in the script, or from data entry collected. Pop-overs: Scripts now appear as pop-overs, rather than being constrained to the right-hand panel. Ticket Updating: Your tickets can automatically update by navigating the script, or by entering data into Zingtree Data Entry Fields. For example, the start of your script could offer the agent a choice of a product, and the “product” field in your ticket will be automatically selected when the agent makes a choice. Note: Don’t remove the current version of Agent Scripting until you are ready to make the switch. Versions 9 and earlier may not be updated going forward. 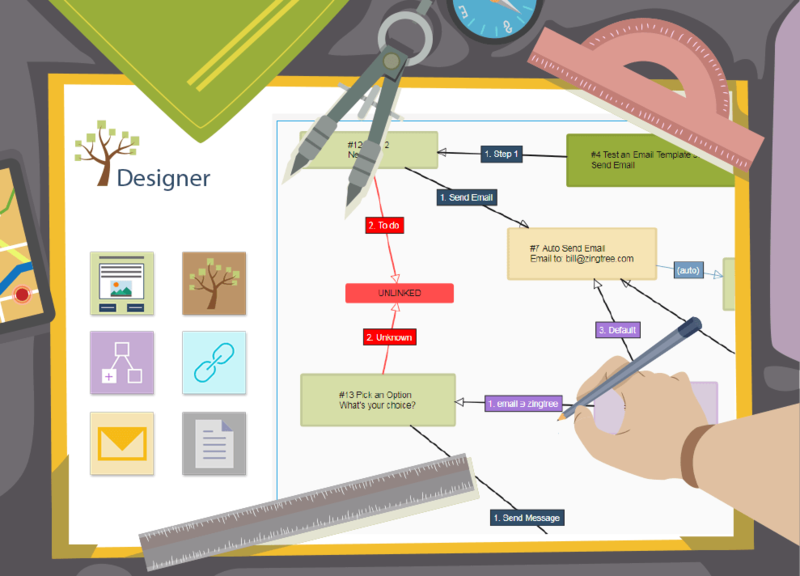 Build an interactive decision tree script with Zingtree (or use one of our demos to start). Install the Agent Scripting App (version 10) into Zendesk. Configure the Agent Scripting app within Zendesk. 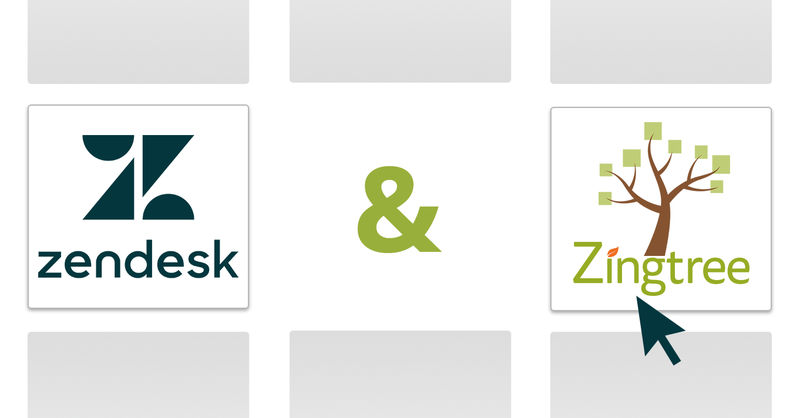 If you want to have your decision tree scripts update your Zendesk tickets, you’ll need to add variables and/or tags to your Zingtree tree to match your Zendesk setup. If you want to enable automatic script selection, you’ll need to add tags to your trees in Zingtree and configure the Zendesk Agent Scripting app properly. Download the Agent Scripting app here. In Zendesk, click the Admin icon and go to Apps > Manage. The Upload App page appears. Enter “Zingtree Agent Scripting” for the App Name. For App File, locate the file zingtree-agent-scripting-v10.zip you downloaded in step 1. Click Upload, then confirm if necessary. Hide Integration Setup Info: When you are setting up Agent Scripting for the first time, you may need some information about your Zendesk setup to take advantage of automatically updating ticket fields. An “Integration Setup Info” link appears by default when you first install the app, and ticking this option hides it. Match Tree Tags to Zendesk Brand: If this option is checked, the subdomain of the selected brand will be matched to a Zingtree tree tag. Any matching tree or trees will appear. For example, if the brand subdomain is xyz.zendesk.com, any trees tagged as xyz (using the Zingtree Settings tool) will appear. Match Tree Tags to Zendesk Ticket Tags: If checked, the values in the Zendesk ticket tags will be matched with your Zingtree tree tags (set via the Zingtree Settings tool) to show one or more matching scripts. Match Tree Tags to values in a Custom field: If you want to use a custom field value to show matching scripts, enter the Zendesk custom field identifier here. The field name can be found using the Integration Setup Info link that first appears in the sidebar when you install the app. Zingtree API key: Each organization in Zingtree has an API key, which is used to match scripts. If you’re using one of the tag matching options, this is required. Your API key can be found at zingtree.com under Help, API. Automatic Script Selection works by matching tree tags you set in Zingtree to values in the Brand, Tags, or a custom field in a Zendesk ticket. For example, if a tree is tagged with “astrology”, and the ticket tags include “astrology”, then that tree appears. If several trees match, then they will all appear, and the agent can choose one. Add tags to your trees for each brand you want to match. So if one of your brands is xyz.zendesk.com, use xyz as a tree tag in Zingtree for all the trees you want to show. Make sure Match Tree Tags to Zendesk Brand is checked in the App Configuration. Add tags to your trees for each tag you want to match. So if one of your ticket tag possibilities is “billing”, use billing as a tree tag in Zingtree for all the trees you want to show. Make sure Match Tree Tags to Zendesk Ticket Tags is checked in the App Configuration. Add tags to your trees for each possible custom field value you want to match. So if one of your custom field values is “billing”, use billing as a tree tag in Zingtree for all the trees you want to show. Make sure the proper Zendesk field variable name is entered for Match Tree Tags to values in a Custom Field is checked in the App Configuration. Select a tree from My Trees. Go to the Settings tool. Enter or select a tag from the Tree Tags field. By entering data into Zingtree data entry fields. The key is to use variable names in your Zingtree that match the ones used in Zendesk. You’ll see the label for the field as it appears in Zendesk’s ticket form, and the Zendesk variable next to it. In the above example, the Product custom field variable is custom_field_22899289. This is a drop-down selector, and the Zendesk values for the field options are astrology and insurance. For the rest of this example, we’ll use custom_field_22899289 as the custom field variable. Go to the Overview tool, and edit the node whose button selections will update the ticket. Make sure Assign Button Click Variable is checked. This makes the other options appear. For the Button Click Variable, enter your custom field variable from Zendesk (custom_field_22899289 in the example). For each button option, enter the value of the variable under Score/Value. If this is a drop-down list in your Zendesk ticket, you’ll need to make sure the Score/Value entered matches one of the drop-down option values as shown in the Integration Setup Info. Click Save Changes when you’re done configuring buttons. Button clicks can also add tags to a ticket. In the above example, clicking Something Else adds the tag other_tag to the ticket. Just include the tag name with two colons after the button text. So entering a button like Something Else::other_tag will add the tag other_tag to the ticket if this is clicked, but agents will only see Something Else as an option. Just like the above example, you can also use Zingtree for data entry, and have that data automatically transferred to your ticket. The key is to use the same variable name in Zingtree as you used in Zendesk. The Integration Setup Info link in the sidebar will give you those Zendesk variable names. You can use trees from the Zingtree Gallery to see how the Agent Scripting app works. For a single tree, enter ’14’ as the Tree ID. 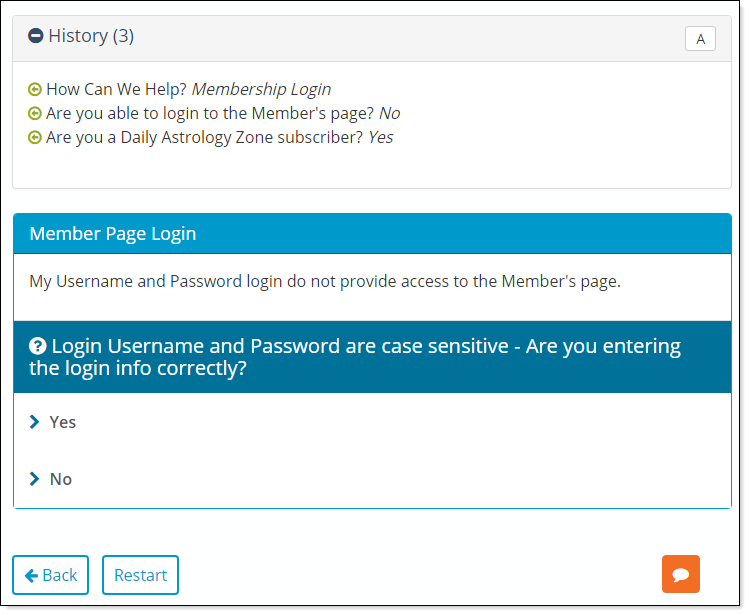 This will show an Astrology website troubleshooter example. Enter 6a103737e44e4aa6e1e4b6b0bcb46f83 as the API key. Make sure Match Tree Tags to Zendesk Ticket Tags is checked. Try entering one or more of these tags into a ticket: “zingtree”, “astrology”, “pet_rock”. Any questions? We’re always here to help.